Napa Valley Vintners has tried to calm concerns that the 2015 Napa wine harvest is under threat from wildfires that have seen California fire crews working day and night to control blazes. Hot and hazy conditions lingered over parts of Napa Valley last weekend as California fire crews continued to battle some of the worst blazes seen in the state for years; exacerbated by a long running drought in the region. Trade body Napa Valley Vintners (NVV) told Decanter.com on Monday (17 August) there were no reports of wildfires damaging vineyards, despite several of the California fires burning on the Napa County border. A secondary concern is smoke taint in the vineyards, where picking has just begun in a historically early Napa wine harvest. ‘Most of the time the fires have been burning, the smoke has blown away from Napa County,’ NVV’s Patsy McGaughy said. ‘This weekend, there was a change in our weather pattern bringing very hot temperatures and causing our air to be hazy and smoky as a result of the many fires burning throughout California. Thousands of firefighters have been deployed in the past fortnight to battle a series of blazes that caused residents to be evacuated from their homes. Three fires closest to the Napa wine region – the Rocky and Jerusalem fires in Lake County and the Wragg fire in eastern Napa County and western Solano County – were either extinguished or under largely control by this week, McGaughy said. 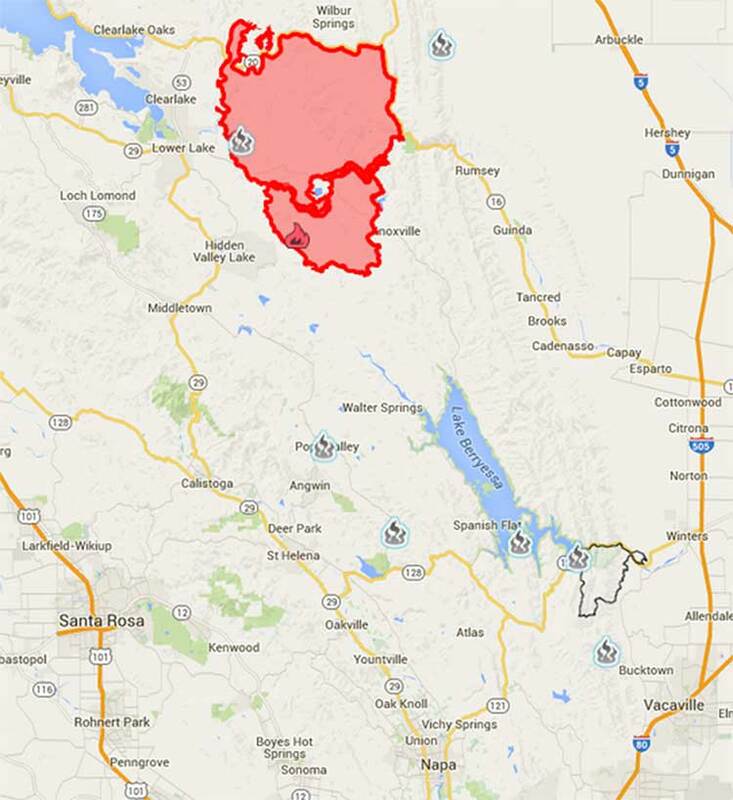 Red areas on the map below shows the perimeter of fires still burning. Grey symbols show fires that have been contained and extinguished since March 2015. Winemakers outside of Napa have also been watching the situation closely. A 150 hectare bush fire in Montebello had to be contained by 150 firefighters on Monday. David Gates, vice president of vineyard operations at Ridge Vineyards, said the group’s Montebello estate survived unscathed, ‘knock on wood’. Further up the US west coast, fire crews have also been tackling fierce wildfires in Oregon. Damage to vineyards was expected to be minimal, said Michelle Kaufmann, of the Oregon Wine Board. In Canada, British Columbia has also been hit by wildfires in the past week. An evacuation order was issued for 100 homes in the Okanagan Similkameen district, but wineries in the area were ‘all still open for visitors’ on Monday, said Wines of British Columbia spokesperson Laura Kittmer.